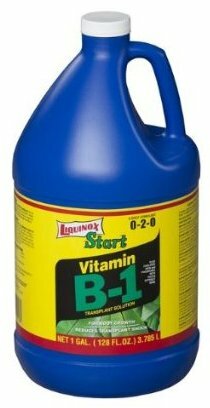 Vitamin B1 stimulates root growth. No, it doesn’t. A study done in the 1930s showed that when disembodied pea roots were placed in a petri dish saturated with vitamin B1 (thiamine), they grew. From this, they concluded that pouring a vitamin B1 solution over newly transplanted plants would help them get established. However, the plants in your garden are not detached pea roots, and they’re not growing in a petri dish. Further research has shown that adding B1 does nothing to help reduce transplant shock, but it will have an effect on your wallet. If you want to encourage roots, look for a product containing a rooting hormone instead. Paint wounds and pruning cuts with tar to prevent infection. 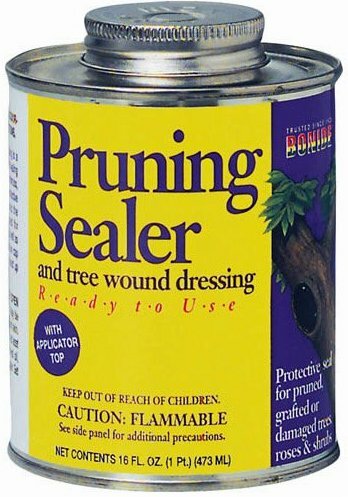 For years, responsible gardeners would paint every pruning cut with some sort of tar product, to “protect the tree.” This was terrific for the tar product manufacturers, but didn’t really do much for the branch stub. In fact, research has shown that applying a dressing of this sort actually increases the risk of decay! If the cut limb isn’t too large, woody plants will eventually grow a “woundwood” layer over a cut surface, protecting against infection. Tar-type dressings interfere with this natural healing process. In addition, the tar traps any fungal spores that do get inside, and the warm, wet environment created there encourages their growth. Sometimes it’s appropriate to lighly paint over a trunk for cosmetic reasons. In that case, use a water-based paint and apply a thin layer. The worst dressings (such as the one pictured here) are petroleum based. Yet, they’re still offered for sale. For best results, however, simply make a clean cut just outside the branch collar and let nature do the rest. Overhead watering while the sun is shining will burn plant leaves. I believed this one for a long time, which is a bit humbling. All you have to do is look around after every rainstorm. Do all the wet leaves suddenly burn? Do farmers run outside to cover their lettuce and other leafy greens every time it rains? It makes sense in theory. We all know that you can incinerate an ant with a magnifying glass and sunlight, and water drops do act as magnifying glasses. However, for those of you who didn’t torture ants, in order to focus the sunlight enough to cause a burn, the magnifier needs to be held a certain distance from the victim. Laying it on the ant would only squash the little guy, not cook him. Similarly, water droplets on leaves are too close to the leaf for the sun to focus sharply enough to cause tissue damage. Midday watering isn’t a great idea for another reason—more of the water is lost to evaporation. It’s best to water early in the day, so leaves have a chance to dry, and fungal spores don’t have a chance to gain a toehold. But if you have to water then, at least you can breathe a sigh of relief—sprinklers and raindrops are safe for plants. Unless they freeze into hail.